The University of Alabama at Birmingham’s Division of Nephrology, part of the School of Medicine, has opened a new weekly patient clinic each Friday at UAB Medicine-Leeds. UAB nephrology physicians Gaurav Jain, M.D., and Vinay Narasimha Krishna, M.D., will be on-site each Friday to provide care at the facility, located off of I-20 at Exit 140, just across from the Bass Pro Shops at 1141 Payton Way, Leeds, AL 35094. 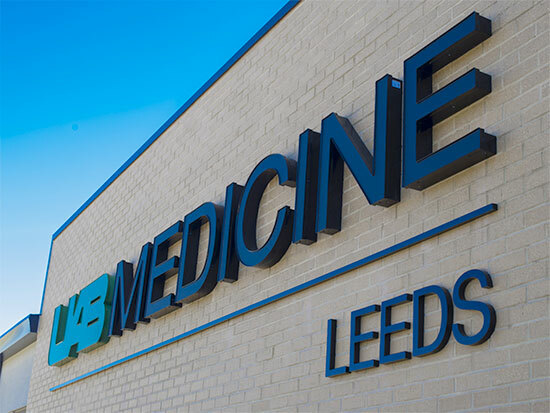 UAB Medicine-Leeds opened in October 2015, offering with it a glimpse of the future of outpatient medicine — where patients have one central location to effectively receive primary and specialty care in a modern, convenient facility. UAB Nephrology physicians at the clinic will provide timely consultations to patients with complex renal issues, including acute kidney injury, chronic kidney disease, uncontrolled hypertension, electrolyte disorders and glomerular disease. Physicians can refer a patient by calling the UAB Medicine Access center at 205-934-3411. Urgent consults can be made by calling 205-934-2646. UAB nephrology physicians aim to accommodate all consults within a week and provide communication back to the referring physician’s office based on the evaluation of the patient. More information for referring physicians is available online. Patients can request an appointment by calling 205-934-9999 or toll-free at 800-822-8816. UAB Nephrology is recognized as one of the top 15 nephrology divisions in the country by U.S. News & World Report, and it is an NIDDK-funded UAB-UCSD O’Brien Core Center, one of seven such centers in the nation.